Every School Leader needs to remember this when Goal-Setting! Setting goals with teachers at the start of every academic term can be a very productive process. However, as simple as the process might seem, it is very often executed poorly. As a result, many individuals fall short of the goals that either they or others have set for them. – Achieve a greater sense of direction:When we know where we are heading we are far less likely to be knocked off course and even when we are, we know the path that will take us back to where we want to get to. – Identify where to focus their time and energy: Clear goals give us clarity of thought and with greater clarity, comes greater wisdom as to how one’s time is best used in pursuit of clear goals. We are better able to master our thoughts and become less prone to dispersed and erratic behaviour that are not in service of our roles and responsibilities. – Feel secure: When we are working towards clearly defined and meaningful goals they give us a sense that even with the ups and downs, all will eventually be well. This added sense of security is part of what helps us to get up and keep moving forward, despite the frequent falls and knockbacks. 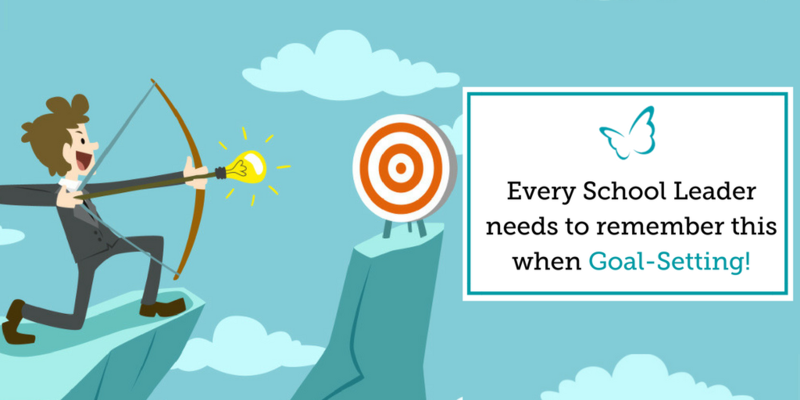 So how can you effectively use goal-setting within your own school context? From my own experience, individuals who feel that they have played a key role in setting their own goals are far more likely to achieve them. This is particularly true when individuals are able to connect their goals with their own sense of vocation and purpose. Our purpose is the motivational engine that compels us to strive for excellence; it’s the fire in our bellies and it is the drive that keeps us moving forward in all range of circumstance. When our goals are fully aligned with our roles, our sense of purpose and drive to achieve them is enhanced. Which is why it is important as part of the goal setting process with teachers to give consideration to their values and sense of professional purpose. – Specific – It is important that the goals you set are clear and well defined. Vague goals are unhelpful because they don’t provide sufficient direction and make it difficult for staff to know what needs to be achieved. – Measurable – That they have an agreed set of success and evaluation criteria. After all, if goals aren’t measurable, how will individuals know if they’ve been achieved? – Attainable – There needs to be some stretch within any goals that are set to support both the growth of your staff and your school. Alongside which, there need to be agreed actions so that staff know the steps that they will need to take to attain them. – Relevant – Needless to say goals should be relevant to the situation your school is in, what it’s priorities are and the individual’s roles and responsibilities. – Time Bound – It is important that goals have a deadline, even if it’s flexible. As this means that you and your team can stay abreast of the timescales you are working towards and make adjustments if necessary. – What is the goal that you want to achieve? – Why do you want to achieve this? – What will it mean to you, when you have achieved your goal? – When do you want to have achieved your goal? – How will you know that your goal has been achieved? – How will be your first steps towards achieving your goal? Likewise, questions such as these about what the outcomes of this goal will look like can also be very valuable in helping to consolidate the end in your team’s minds…. – What will be different? – What will you see? – What will you hear? – What will you feel? Finally, remember that goal setting is an ongoing activity not just a means to an end. Build in reminders to touch base to ensure they are still relevant, necessary, attainable and on track to be achieved. These frequent re-visits can also give your staff a chance to re-focus on the goals in hand and the opportunity to reflect on next steps and successes so far. In my years of working with school leaders, I’ve learned that one of the most important skills any school leader can have when trying to deliver the best outcomes for their school is the ability to effectively manage, nurture and empower the wide range different personalities and relationships within their school. Very often I’ve seen how when school relationships are positive – the outcomes tend to be more positive too. Conversely, when relationships are strained or neglected, school teams can struggle to effectively work together and staff can find themselves increasingly becoming disconnected from what the school and their leaders are trying to achieve. In turn, leaders can find themselves spending a large amount of their time dealing with people management issues, rather than focussing on the more strategic aspects of the role. Yet in spite of this, many leaders have not received significant training or opportunities to develop some essential skills that can help them to deal with difficult conversations, identify how best to manage and maximise staff performance.